MicrosoftThe new Your Phone app lets you view texts and photos from your Android phone in Windows 10. Microsoft just released the October 2018 Update for Windows 10. The headlining feature: An app, called Your Phone, that lets you send and receive texts and view photos right from your Android device. Sorry, iPhone users – Your Phone only lets you send links to view on, uh, your phone. Microsoft promises that at least some more features for iPhone users are on the way. Apple has similar integrations between its Mac and iPhone. This is a big step for Microsoft towards embracing the smartphone with Windows 10, given that it doesn’t have a viable phone operating system of its own. In addition to a blizzard of new Surface hardware, Microsoft also announced at an event on Tuesday that it has started to roll out the next big update to Windows 10. The October 2018 update, as it’s called, has one big, headlining feature: A new app, called Your Phone, that lets you read your Android phone’s text messages and view your Android phone’s photos from your Windows 10 PC. And it works over WiFi, so you don’t need to have your phone plugged into your computer to make it happen. The big caveat: Your phone needs to be running Android 7.0 or up. If you have an iPhone, you lose some of the benefits of the Your Phone app. For iPhone users, the only supported feature at the moment is the ability to send a webpage link from your PC to your phone. Still handy, but less so. But wait, there’s more: Microsoft also used its event to tease another forthcoming new feature. At some point, you’ll be able to mirror your Android phone to your PC’s desktop, so you can use any app without leaving your keyboard. MicrosoftMicrosoft Windows Timeline can tell you what you were working on, when. Now, it’s coming to Android phones. And finally, Android users are getting one more superpower with the new Windows update, beyond the Your Phone app. 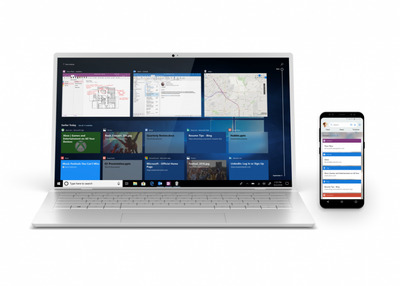 Earlier this year, Microsoft unveiled Timeline, a Windows 10 feature that kept track of which files and webpages you were accessing, and when, so you could figuratively trace your digital steps and find what you were looking for. Now, Android users can install the Microsoft Launcher app, and access that same Timeline, so you can find the website or Office 365 file you wanted. Microsoft says that it’s coming to iPhone at some point soon, as well. Oh, one more thing. This isn’t strictly related to the phone stuff, but the new update also adds a so-called Cloud Clipboard that lets you copy text or images from one PC, and paste it on another. Plus, it keeps a history across devices of everything you’ve copied. It’s a little thing, but probably useful to many. The texting features are very similar to one of the best parts of the Apple ecosystem: If you own a Mac and an iPhone, your texts flow freely between them – you can start a conversation on your laptop and finish it on your phone, or vice versa. A feature called AirDrop, too, makes it easy to share photos and other files between all Apple devices. Google has tried to close that particular gap with the recent introduction of an Android messages app for the web browser. 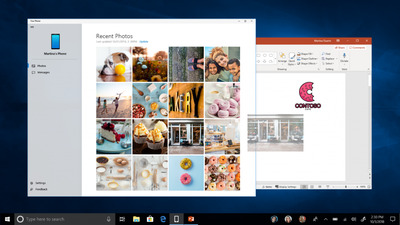 However, what Microsoft is offering Android users is something built right into the operating system, so you can click and drag photos straight from your phone into an editing or social media app. All in all, it’s a reflection of Microsoft’s recognition that, without a viable phone platform of its own, it needs to integrate tightly with the iPhones and Androids of today to stay relevant. While it’s clear that there’s a lot of work left to do, this is a promising first step. Generally speaking, if you have automatic updates installed, the Windows 10 October 2018 update will start going out in waves on October 9th. If you’re dying to have it now, though, you can go into your PC’s settings and have it check for updates, per the instructions from Microsoft here.